Mobile Sales Assistant Tablet Intel Celeron 1007U w/ Built-in smart card reader and magnetic stripe card reader, Designed with IP 54 front panel protection rating and 1.2M drop survival. The ICECARE-10W is designed to suit the hospitality industry, specifically for restaurant, hotel, and retail applications. 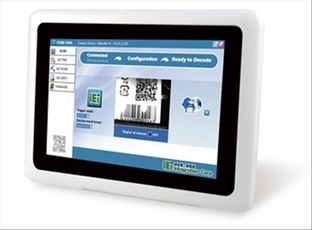 Powered by the Intel Celeron 1007U processor and Windows Embedded Standard 7 operating system, the ICECARE-10W is integrated with a barcode reader, an RFID reader, a smart card reader and a magnetic stripe card reader for business usage. It offers an all-in-one mobile solution for services that are looking for a stylish yet durable device.